How to order food easily and quickly? 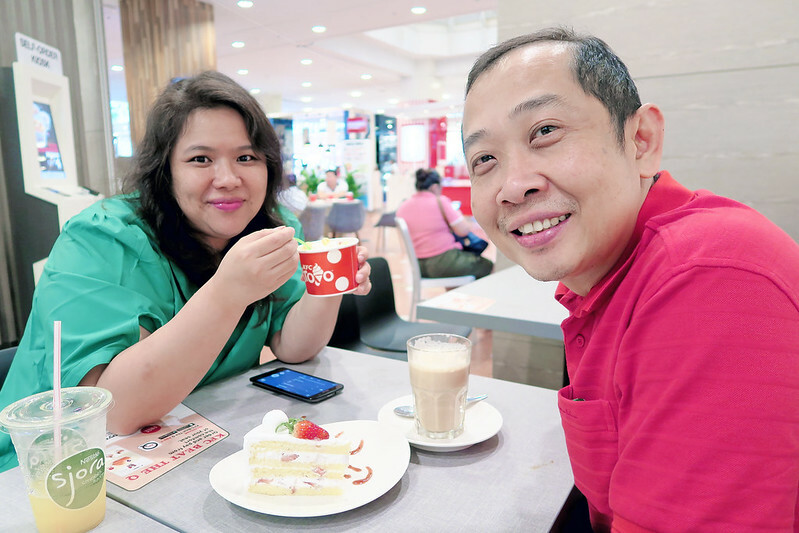 My dad usually sleeps in the afternoon because he works night shift but luckily he wasn't tired that day and we decided to head out for awhile before meeting grandma! 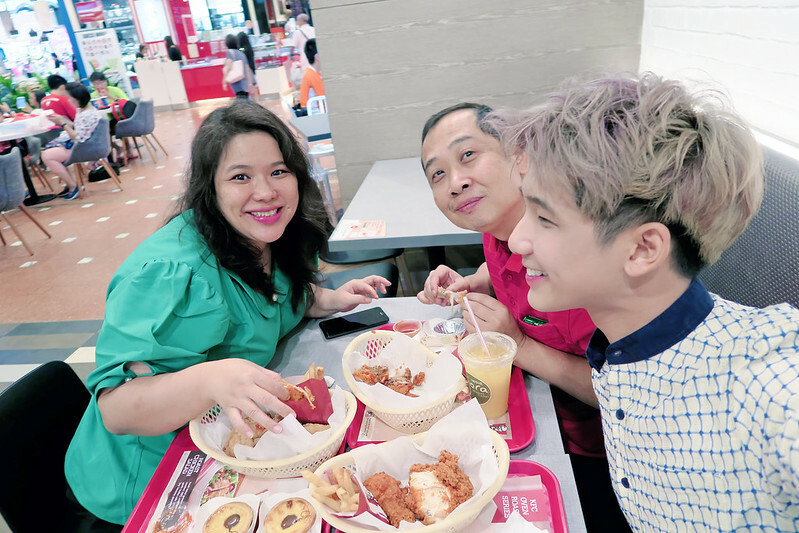 We went to Jurong Point and as we were walking around, thinking of what to have for lunch.... We passed by KFC and saw that it was revamped and they even have a self-order kiosk now near the entrance! We then decided to go check it out since it's new there! 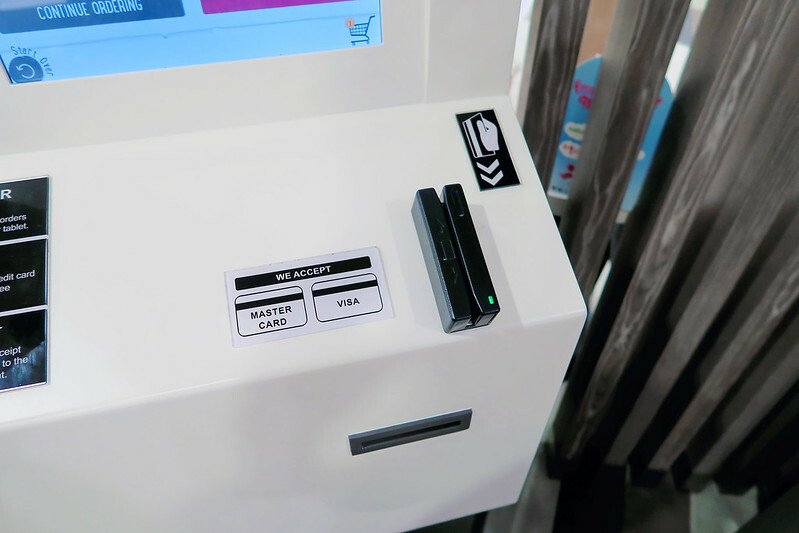 I must say we were really impressed by how the self-order kiosk is really easy-to-use and simple to navigate! The menus are all displayed in there and it's really clear on how to order as you just need to follow step by step! Mum was getting really excited because she saw a lot of new food menu that she wanted to try and I find that by using this kiosk, it's easier to collate the long list of orders from different people with less confusion! Save a lot of time and trouble! After that, they will prompt you to choose whether you're taking away or dining in... and then you pay! Gonna pay with my card and you see, beside me is 2 elderly couple using the kiosk to make their order too! Making payment is easy, just with a swipe and I heard that they are exploring more payment modes as well! Done with the order and gotten my order number! Just have to collect my order later! I find dining with technology really helpful, especially during lunch crowd! Or those who are eating alone, can order the food using the kiosk and they can have time to find seats while waiting to pick up their order. 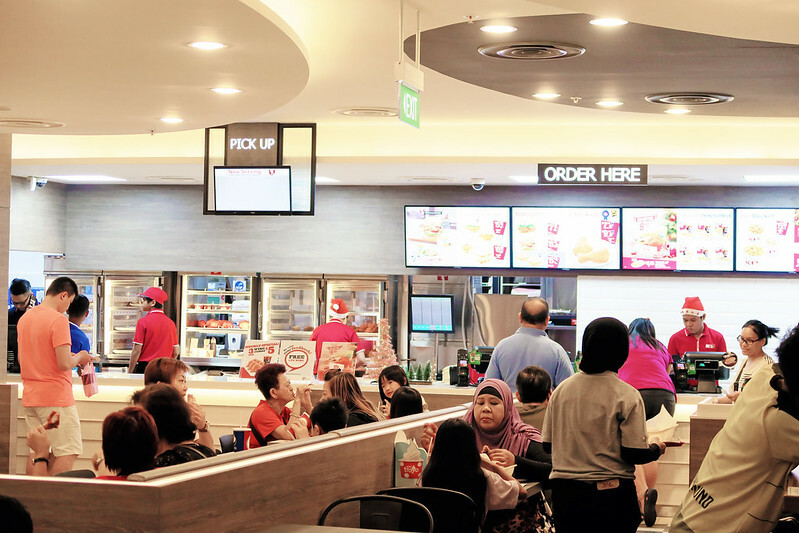 Or if you're with a group of friends, you can just easily collate the orders and get someone to order on the kiosk while the rest can just catch up while waiting for food. 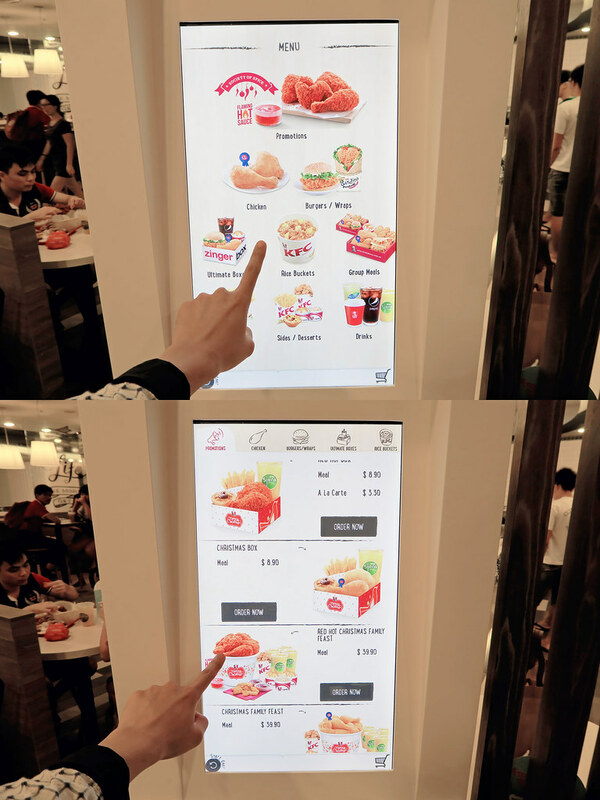 It's not just at KFC, but in general, I think the whole F&B sector that are adopting such technologies are trying to enhance our overall dining experience. No more long queues or waiting! Another option for us to order our food, which is really cool! 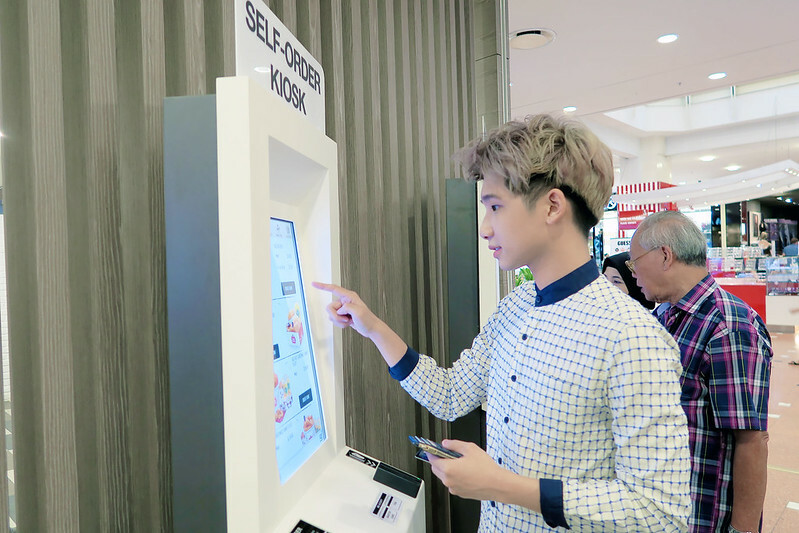 Other than using the self-order kiosk, KFC also came out with an app for you to 'Beat The Q'! 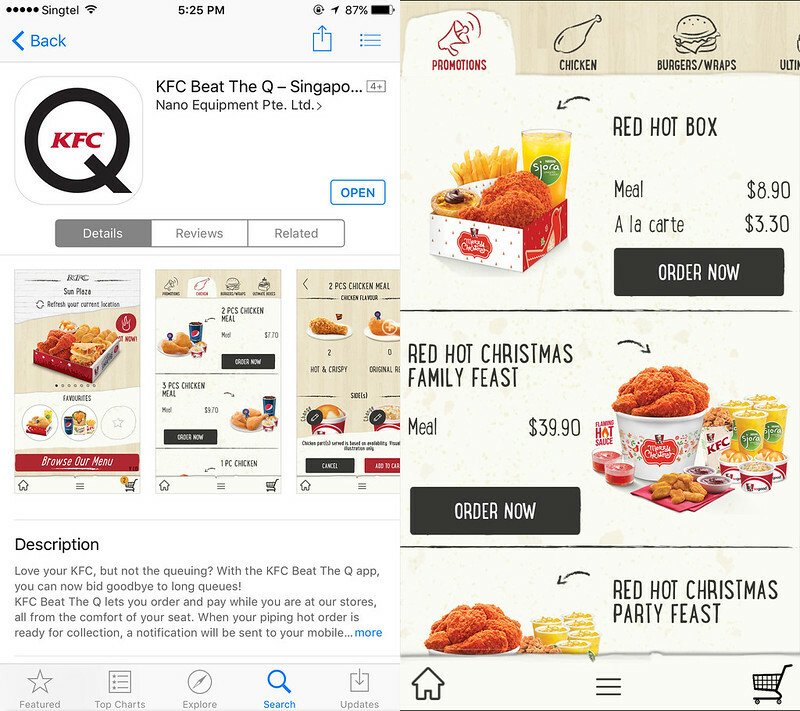 With this KFC Beat The Q app, you can order and pay while you are at the stores, all from the comfort of your seat! 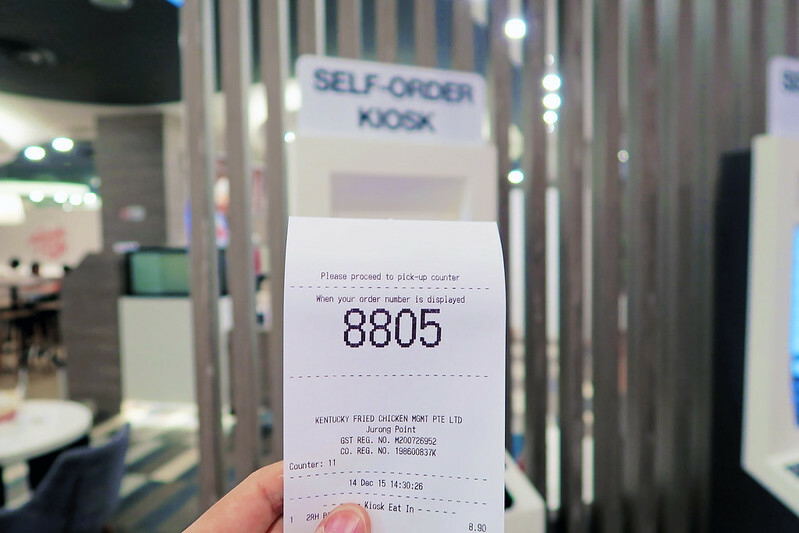 We just have to go collect our food at the Pick Up counter when our queue number is being displayed on the screen! 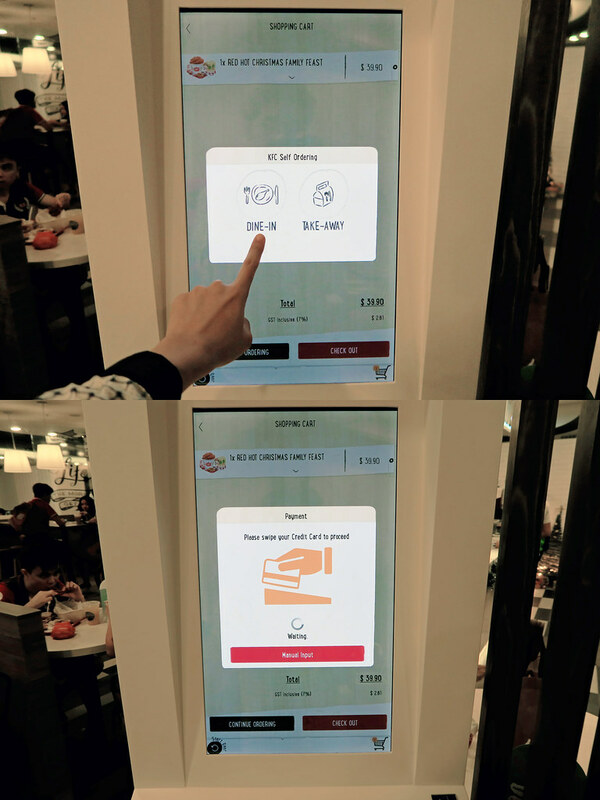 I also heard from the friendly KFC crew that the self-order kiosk and Beat The Q App service is available at 3 locations - Jurong Point, Kallang and Sun Plaza and they have intention to introduce this service to more restaurants in the near future! Can't wait! Yay collecting my KFC Red Hot Box which I also ordered for both my parents too! The KFC Red Hot Box comes with 2 pieces of Red Hot Chicken (served with 1 tub of Flaming Hot Sauce), 1 regular French Fries, a Double Chocolate Egg Tart and a SJORA® Mango Peach! 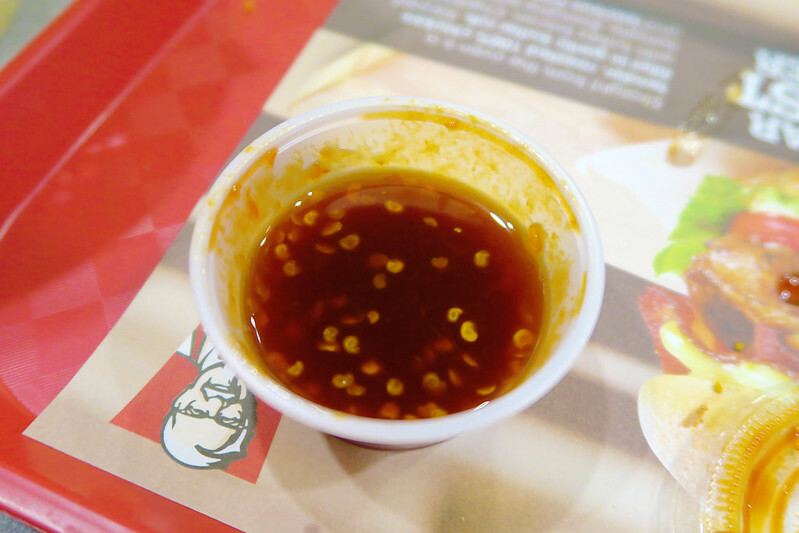 Mum loved the Flaming Hot Sauce and she literally dipped it with everything! I really love the chicken, the paprika batter is so crispy and yummy! 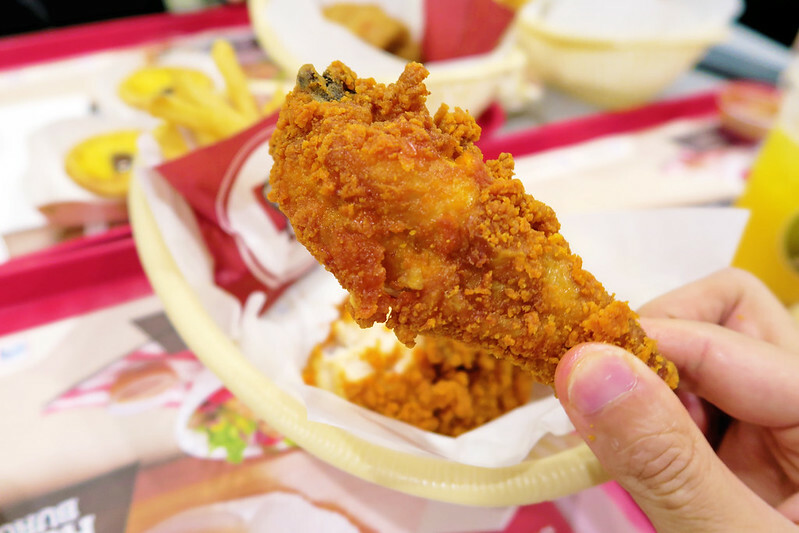 Best combination for me is thigh and drumstick! What about you? Mum and dad didn't had breakfast, so when the food came... they started eating!!!! Don't even wanna care about me lol. 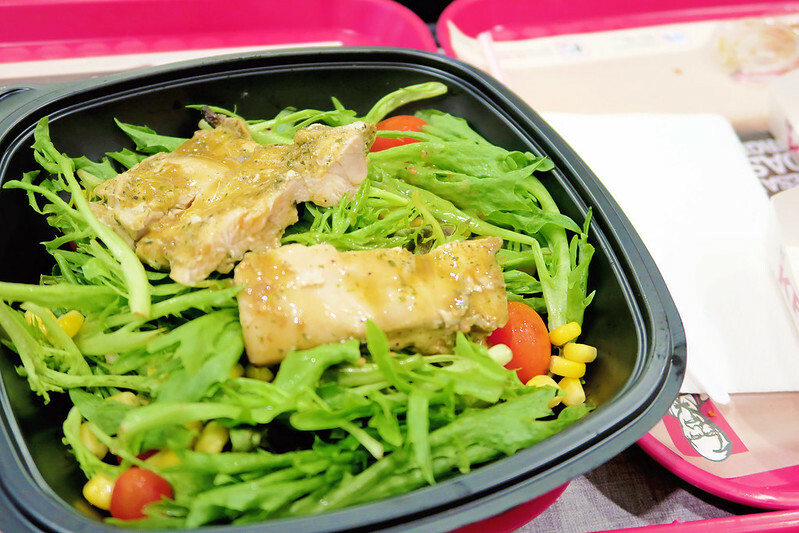 Mum also ordered the Roast Chicken Salad with Soy Sesame Dressing to try because she say she didn't had it before! Time for desserts! My mum and I are huge fan of KFC froyo, so wouldn't leave the place without having it! Original froyo with fruit loops! 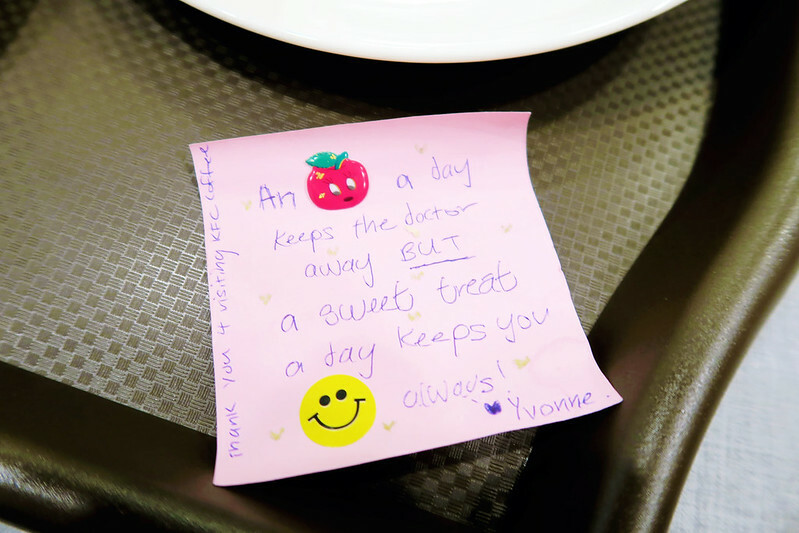 A sweet note from service crew! The best things in life are meant to be shared! 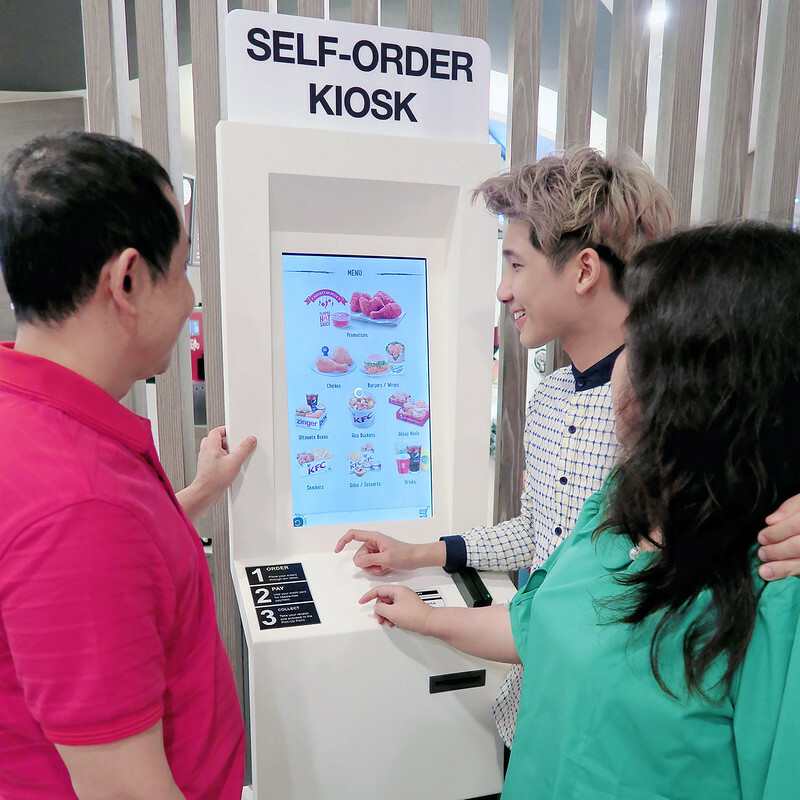 Wonderful first time experience with the self-order kiosk and we really had fun with the interactive ordering system! Hopefully we will see more of it in all the F&B stores in the near future!